The metacarpals are the five bones of the hand that connect the carpal bones (wrist) to the proximal phalanges (fingers). (Phalanges is plural, phalanx is singular.) 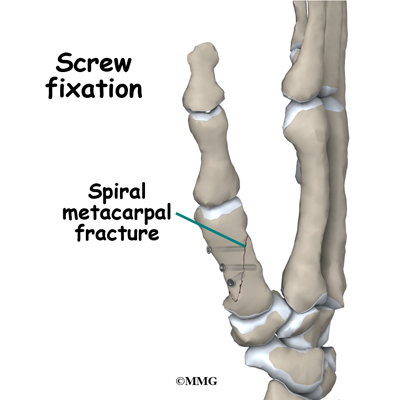 Because of the special role the thumb plays in grasping, fractures of the thumb metacarpal are a bit different from fractures of the finger metacarpals. The thumb metacarpal is a tubular bone; the distal end (far end) is a round knob that forms a joint with the proximal phalanx of the thumb. 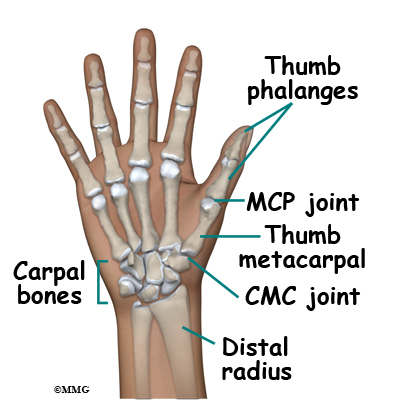 The proximal end (near end) of the metacarpal and a carpal bone called the trapezium form a joint called the metacarpophalangeal (MCP) joint. 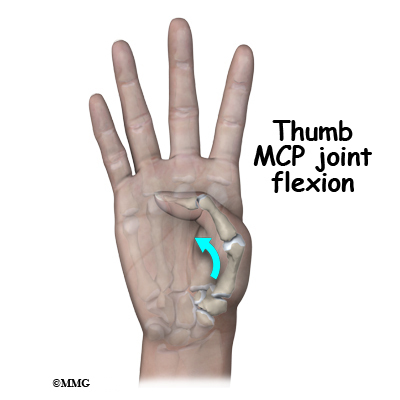 The MCP joint has a great deal of motion in bending the thumb. 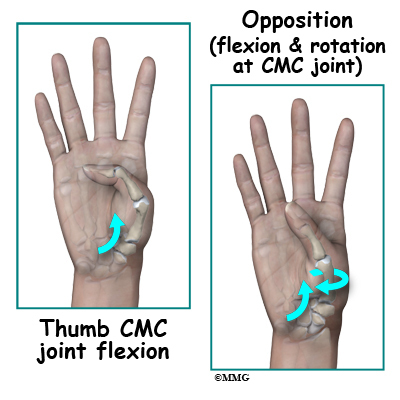 The proximal carpometacarpal (CMC) joint has a great deal of motion in several directions. One motion allows the thumb metacarpal to rotate away from the palm (called opposition); another allows the thumb metacarpal to bend (called flexion) into the palm. The combination of these motions are what allows us to grasp objects. A thumb metacarpal fracture can occur in a multitude of ways: a fall on the outstretched hand, a crushing injury or suffering and injury that wrenches the thumb away from the palm. There is usually immediate pain and swelling in the thumb. You may also see that the thumb is deformed. 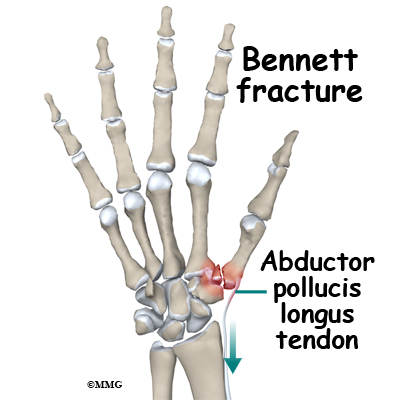 It is common to see a bump over the back of the thumb where the fracture is located and angulated (or bent). Motion is painful; you will probably not be able to grip using the thumb due to pain. The primary goal of the clinical evaluation of a thumb metacarpal fracture is to determine the pattern of the fracture. Based on the fracture pattern, your surgeon will need to decide if 1) the fracture is in stable alignment and can be simply protected in a cast or brace until it heals, 2) the fracture pattern can be reduced (or manipulated) to a stable alignment without surgery and held with a cast or brace until it heals or 3) surgery will be necessary to align the fracture fragments and fix the fragments with some combination of metal pins, metal plates, and metal screws. The fracture is evaluated by taking several x-rays of the hand and thumb. Your surgeon will pay particular attention to fractures that involve the joint between the trapezium and the base of the thumb metacarpal. These fractures can both affect the stability of the joint and damage the joint surface, leading to weakness or continued pain after the fracture heals. 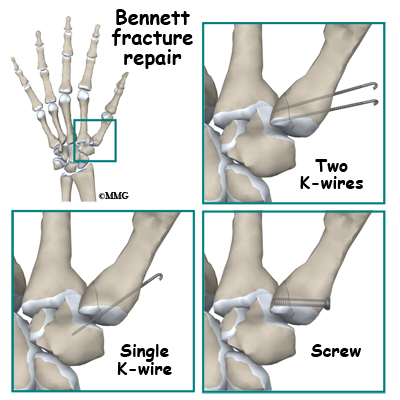 You may hear your surgeon refer to these fractures by name: Bennett's Fracture or Rolando's Fracture (named after the physicians who initially described the fractures). These fractures commonly require surgery to repair the joint surface. Many thumb metacarpal fractures do not require surgery. 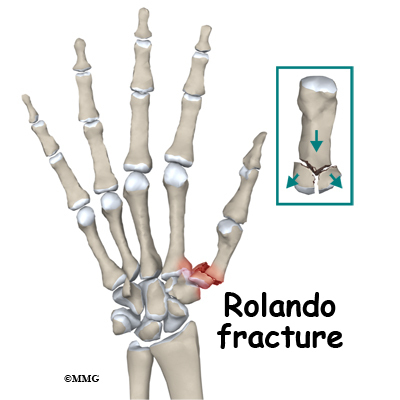 If the fracture involves either the joint at the base of the thumb (the carpometacarpal joint) or the joint at where the thumb joins the proximal phalanx (the metacarpophalangeal joint), surgery may be required to repair the joint. If the fracture is open, meaning there is a laceration that connects with the fracture, surgery is required to cleanse the fracture fragments and reduce the risk of infection. If your surgeon decides that the fracture can be treated without surgery, then a splint or cast is used until the fracture heals. If your surgeon decides that the fragments should be manipulated (or moved) into alignment, then a closed reduction will be performed to better align the fracture fragments. To perform a closed reduction, a local anesthetic block is used to numb the area around the fracture. Once the fracture is no longer painful, the surgeon will use a combination of pulling and pushing to align the fracture fragments into an acceptable position. A padded splint that supports the wrist, hand, and thumb is usually applied. 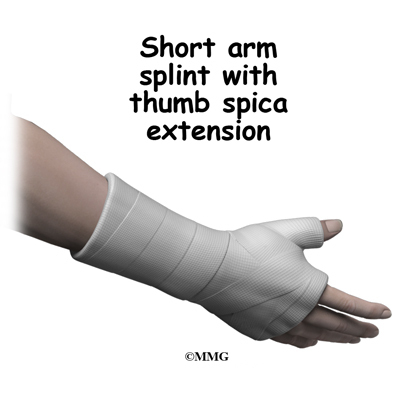 Most fractures of the thumb metacarpal heals enough in three or four weeks to remove the rigid splint and begin gentle, protected range of motion. X-rays will be taken frequently to make sure that the fracture remains in alignment. Once your surgeon thinks that the fracture has healed, the cast or fracture brace are discontinued and you will work with a physical therapist to regain the motion and strength in the arm, hand, and thumb. A thumb metacarpal fracture may require surgery. If your surgeon makes the assessment that the fracture will NOT give you good hand function without surgery, surgical treatment will be recommended. If the fracture cannot be held in acceptable position with a cast or fracture brace and the fragments begin to separate, surgery may be suggested after several days or weeks of attempting nonsurgical treatment. 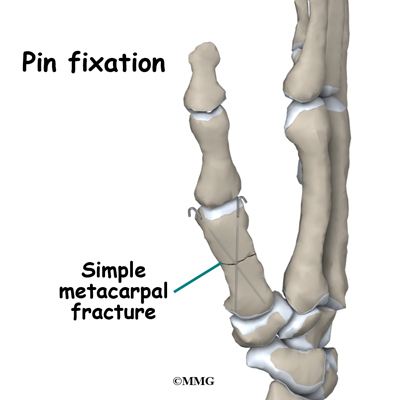 Surgical treatment of a thumb metacarpal fracture can be performed in several ways: metal pins placed through the skin and into the fracture fragments to hold them in place or a combination of small metal screws with or without a small metal plate along the side of the bone. Surgical treatments that range from relatively simple to more complex may be considered depending on the fracture pattern. Simple fracture patterns may be treated by placing metal pins through the skin and into the bone fragments to hold the fragments in position as they heal. These pins are inserted while you are in the operating room with the aid of a special X-ray machine called a fluoroscope. The fluoroscope allows the surgeon to see an X-ray image of the bones on a television monitor and guide the placement of the pins by viewing this image. This type of surgery may be done as an outpatient. 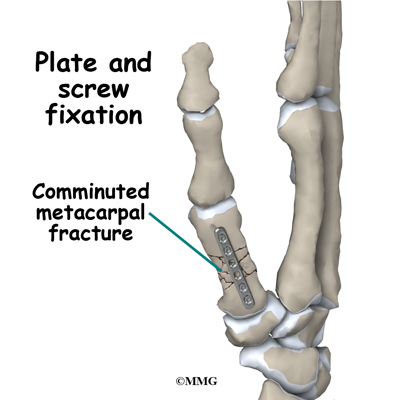 Some thumb metacarpal fractures require Open Reduction and Internal Fixation (ORIF) using small metal screws or a metal plate and screws. This type of treatment allows the fracture fragments to be restored as close to their normal position as possible and held there until healing occurs. This type of treatment may be necessary to restore the alignment as close as possible. This type of treatment is more likely to be required for fractures that involve the joints of the thumb metacarpal. ORIF usually requires an incision on the back of the thumb (dorsal). Nearly all fractures can result in damage to nerves and blood vessels; but this is a rare complication of most thumb metacarpal fractures. Because metacarpal fractures are sometimes associated with punching someone, lacerations (cuts in the skin) can occur over the knuckles as part of the injury. When these lacerations are caused by human teeth, there is a great risk of serious infection complicating the fracture. This will usually require immediate surgery to cleanse the wound, the knuckle joint and possibly the fracture to reduce the risk of serious infection. Chronic Regional Pain Syndrome (CRPS) is another uncommon, but serious, potential complication of metacarpal fractures. The cause of this problem is unknown; CRPS can occur anywhere in the body but is more common in the extremities - the arm and leg. In a few patients following a fracture of the hand, the arm and hand become immediately swollen and intensely painful. The nervous system of the extremity seems to become deranged. Treatment consists of medications to control the nerve pain, injections to block the sympathetic nerves to the extremity in an attempt to stop the process and physical therapy to regain function as soon as possible. CRPS can be very frustrating and become a chronic condition; luckily, this complication is rare. The prognosis for thumb metacarpal fractures is generally excellent. The thumb and fingers become stiff very fast after being immobilized - whether they are injured or not. Most hand surgeons try to limit the time that the thumb and fingers are immobilized and begin physical therapy as soon as possible to prevent stiffness from occurring. Rehabilitation will begin once your surgeon feels that the fracture is stable enough to begin regaining the range of motion in your wrist, hand, and fingers. If surgery has been required, the rehabilitation program will be modified to protect the fixation of the fracture fragments. Your surgeon will communicate with your physical therapist to make sure that your rehabilitation program does not risk causing the fixation to fail. If the surgeon feels that the fixation is very solid, you may be able progress your program quickly; if the fixation is not so solid, the speed at which you progress may need to be slowed until more healing occurs.